Harnessing the power of software platforms: what executives and entrepreneurs must know about how to use this technology to transform industries and how to develop the strategies that will create value and drive profits. 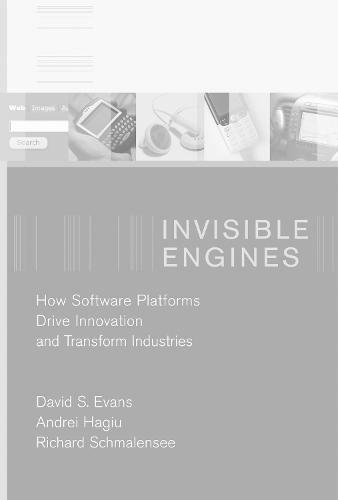 Software platforms are the invisible engines that have created, touched, or transformed nearly every major industry for the past quarter century. They power everything from mobile phones and automobile navigation systems to search engines and web portals. They have been the source of enormous value to consumers and helped some entrepreneurs build great fortunes. And they are likely to drive change that will dwarf the business and technology revolution we have seen to this point. Invisible Engines examines the business dynamics and strategies used by firms that recognize the transformative power unleashed by this new revolution-a revolution that will change both new and old industries. The authors argue that in order to understand the successes of software platforms, we must first understand their role as a technological meeting ground where application developers and end users converge. Apple, Microsoft, and Google, for example, charge developers little or nothing for using their platforms and make most of their money from end users; Sony PlayStation and other game consoles, by contrast, subsidize users and make more money from developers, who pay royalties for access to the code they need to write games. More applications attract more users, and more users attract more applications. And more applications and more users lead to more profits. Invisible Engines explores this story through the lens of the companies that have mastered this platform-balancing act. It offers detailed studies of the personal computer, video game console, personal digital assistant, smart mobile phone, and digital media software platform industries, focusing on the business decisions made by industry players to drive profits and stay a step ahead of the competition. Shorter discussions of Internet-based software platforms provide an important glimpse into a future in which the way we buy, pay, watch, listen, learn, and communicate will change forever. An electronic version of this book is available under a Creative Commons license.